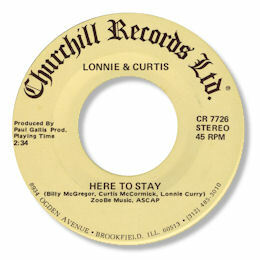 On an obscure label out of Brookfield, IL come Lonnie Curry and Curtis McCormick with this gentle but highly effective ballad Here To Stay. The combination of the high tenor and deep baritone voices really sets the scene for this tale of true love, and the careful arrangement of the rhythm section adds to the mood perfectly. A real grower. Note the name of fine Chicago vocalist Billy McGregor among the writers.